This set was played with in the 70's! The Parking Garage and Garage Lift to this set had been broken and thrown out. The building is approximately 11" tall. with Mr. Hoopers store, alleyway, and apartment building. Set also includes Grover, and Roosevelt Franklin. 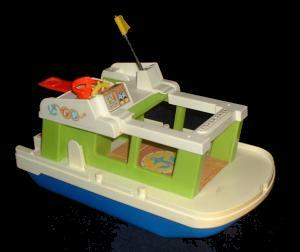 © 1969, 1980 Fisher-Price Toys. This House has approximately a 15" x 9" footprint. Masonite base, wood/litho and plastic/litho walls, and plastic roof. Doorbell rings, front door opens, and garage door opens. This Houseboat has approximately a 13" x 7" footprint. Shoe is approximately 9" tall and 9" long. Base, wheels and roof are wooden. Shoe top and sides are plastic covered with paper lithos. "There was an old woman, who lived in a shoe..."
and different pictures can be seen through the clear windows. The front of the shoe flips up and three little people can ride inside. The shoe came with a white and red braided lace and three wooden little people. This train actually was 4 cars long. It also came in a 3 car version. This train is missing the cage car and the flatbed car. When the yellow smoke stack on the top of the engine is pressed, the train toots. Also, when pushed along, the engine clicks. This Castle has approximately a 16" x 12.5" footprint. The highest tower is approximately 14" tall. secret room behind movable stairs, and moving draw bridge. This set was played with in the early 70's and is very worn. When pushed along, the people in the front seat jiggle. These are the five all plastic little people which came with this set. The faces are rubbed, the edges of all pieces are jagged with wear, and the boys hat is missing it's visor. These toys were definately well loved. some of the accessories for no. 994. Missing from this set is the BBQ and white sink.